If I had to pick only one MAC product to live for the rest of my life that would be an eyeshadow. 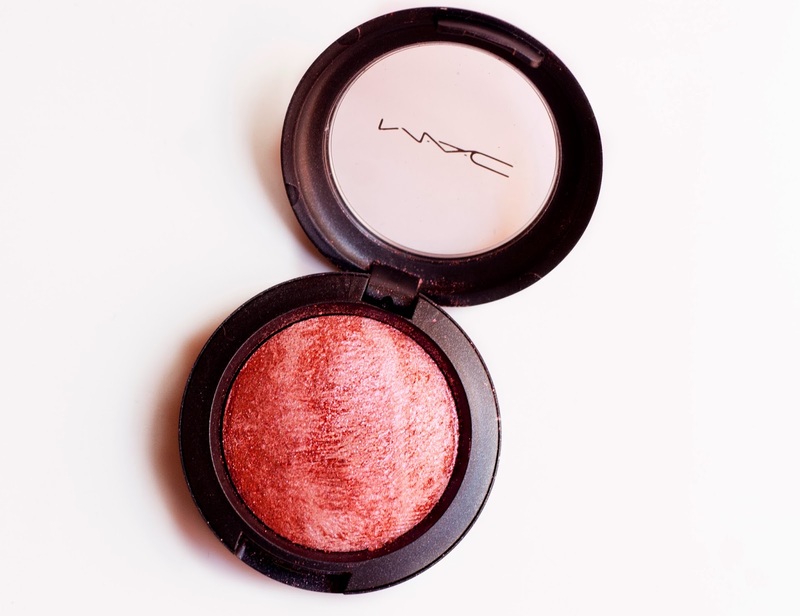 I naturally assumed all MAC eyeshadows would feel rich and highly pigmented so I was quite surprised when I got the MAC Mineralize Eyeshadow in the shade Caribbean. MAC says that these mineralize eyeshadows have a powder formula that "provide exceptionally sheer coverage and lightweight application and that the color builds lightly, layer after layer, without heavy coverage. They also describe Caribbean as a "rose with pink and red pearl". When I first saw Caribbean I was over the moon. It looks gorgeous on the pan and reminds me of a lighter version of Cranberry (review here) with pink tones and beautiful glitters. I tested it on my fingers and the first thing I noticed is that it felt dry. Being used to MAC's eyeshadows traditional creamy texture I found this quite strange. Second thing I noticed is that it was sadly very powdery compared to other MAC eyeshadows and definitely not as pigmented either. 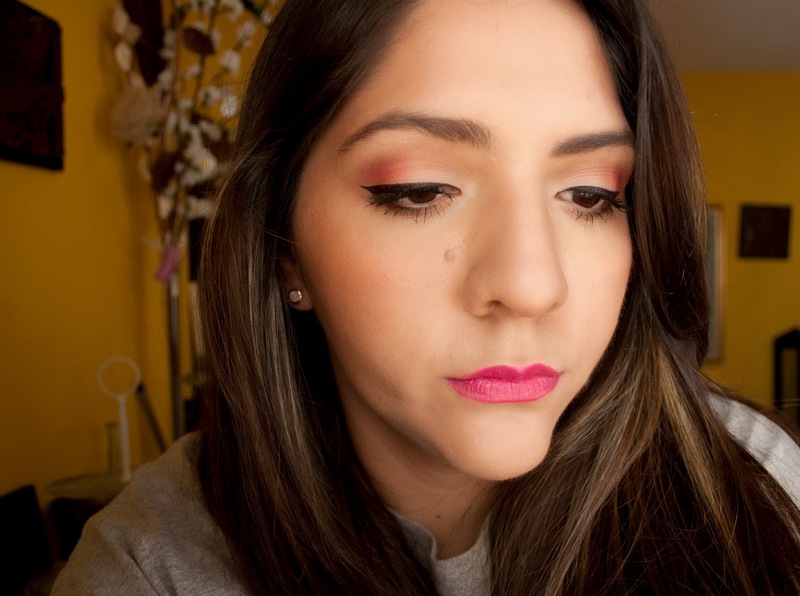 Applying Caribbean onto my eyelids wasn't fun either. I used the NYX Jumbo Eye Pencil in Milk as an eyeshadow base and only attempted to apply Caribbean in the corner of my eyelids with a MAC 217 brush. Total mess. Glitters everywhere except where they should be. Tried with a smaller brush, it was a bit better. I do not like to wet my eyeshadows but I think the results would be better with some water, however this is just way too powdery and even if MAC recommends to build it in layers, I seriously doubt it's gonna work. Some minutes after that I gave up and ended up applying the Kiko eyeshadow in Sparkling Orange as a base eyeshadow, a bit of Cranberry and some Caribbean over it. Not bad but it's not what I wanted plus.. Do you guys see any glitters? This is the most dissapointed MAC product I've ever tried. It's powdery, not pigmented and expensive (around $20-$26 depending where you live). I think this would do an okey job as a highlighter or blush though, haven't tried that yet. Have you had any similar experience with any MAC product? Si tuviera que elegir sólo un producto de MAC para vivir el resto de mi vida serían obviamente sus sombras. Naturalmente asumí que todas serían muy pigmentadas y cremosas aunque sean en polvo. Lamentablemente me llevé una sorpresa cuando probé la sombra Caribbean de la colección Tropical Taboo Mineralize. Cuando vi a Caribbean me encantó, se veía genial en el envase y me recordó a Cranberry pero un poco mas claro y con glitters. La probé en mis dedos y lo primero que noté es que se sentía seca, nada de textura cremosa. Lo segundo que noté es que era demasiado polvorosa, literalmente había glitters por todos lados y ni hablar de la pigmentación. Aplicarla en los párpados no fue mucho mejor. Usé como base los jumbos de NYX en el tono Milk y sólo apliqué Caribbean en los costados de los ojos y fue un desastre total. Lluvia de glitters literal. Traté con diferentes brochas y nada. Pienso que puede resultar mejor usarla con agua pero a mi personalmente no me gusta. MAC dice que hay que trabajarla en capaz pero para mi todo eso es patrañas! Al final terminé usando la sombra Kiko Sparkling Orange, un poquito de MAC Cranberry y Caribbean encima. No resultó tan mal pero no es lo que quería, además... ustedes ven glitters? Así que este es oficialmente el producto mas decepcionante que probé de MAC, es muy polvorosa, poco pigmentada y cara ($20-$26 depende donde vivas). Quizás estaría buena de iluminador o rubor pero no lo probé de esta forma. ¿Ya tuvieron alguna experiencia similar con productos de MAC? Flor que bajón se ve tan linda, y en el look te quedo divina. Pero con lo que salen uno espera mejor calidad y no tanto trabajo para aplicarlas. Aww that's such a shame! I really like the look you've created but it's a shame that it required so much effort and you didn't even get the look you were after. It's stunning in the pan too! If only it translated onto the eyes. Te digo la verdad, apenas vi las fotos crei q se trataba de un rubor! Garron por esa plata que termine siendo tan porqueria. En la foto casi ni se perciben los glitters... desilusion! I never had any luck with their Mineralize eyeshadows! But I looove their regular eyeshadows. Their Mineralize Skinfinish powder, however, I really like! :) Regardless, YOU LOOK SMASHING FLO! I swear, you did a great job on your eyes despite the ultimate fail of the eyeshadow :) You so gorgeous, gurl! Ouuu that looks so nice, great look!!! what a shame, usually the MAC Mineralize Eyeshadow are good quality. me gusta cómo se te ve! pero si tiene mucho brillo pues no sé... no me gustan mucho los coloretes con brillo :( qué lástima!